Wow, it's been over a month since my last installment of Life in the Big City. I guess we're on slow summer time around here. Once again, the "big city" was abandoned over the long 4th of July weekend as we headed out east. For those of you not familiar with New York, the eastern tip of Long Island is sometimes referred to as the east end or the south fork and encompasses the Hamptons and Montauk. And Brian and I set aside one of the weekend days for a little road trip. Along the way is the town of Amagansett and we stopped at their famed farmer's market, currently managed by Eli Zabar. It offers not just fresh produce but also plenty of prepared gourmet food and fresh baked goodies. 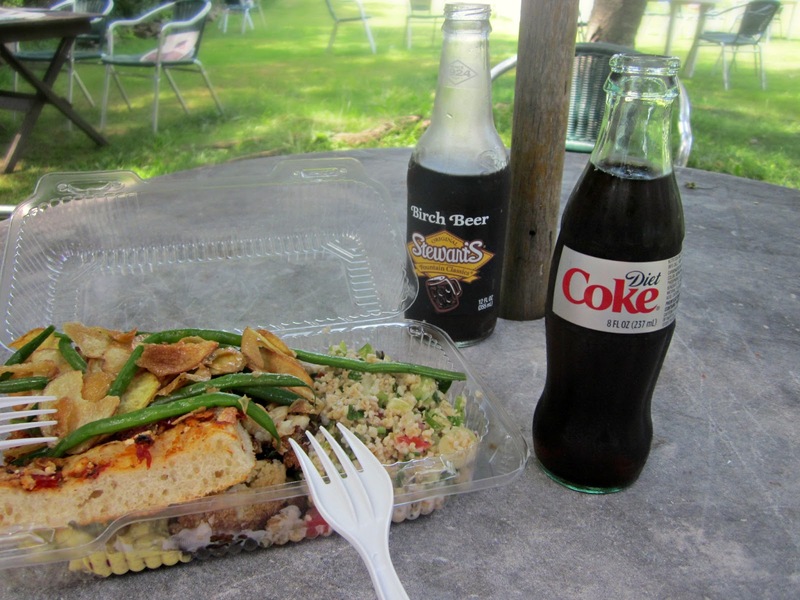 We got some assorted salads and ate our meal at one of their outdoor tables. It was a hot day but we were fine with our cold drinks, under their large market umbrella. On the drive back, we stopped in for a drink at Cyril's, located between Montauk and Amagansett. My bestie and her hubs love that place and clued us in to their signature BBC (Bailey's Banana Colada) cocktail. Well, we had to give it a try. The summer crowds were out in such full force that we wondered if we'd even get anywhere near the outside bar. But a cocktail waitress, carrying a tray of BBC cocktails, quickly found us. The signature drink is so wildly popular that they pre-make it and walk around with trays of it for sale. At $12 each (not unreasonable for the area), you can get your drink from one of the roving waitresses and avoid the crowds at the bar altogether. The atmosphere at Cyril's is a little young and loud for our taste but the drink was delicious. Back home, got out the blender and got to work cracking the recipe. It was actually quite easy to recreate and we were able to enjoy it leisurely in our garden. Puree all ingredients in a blender with ice. 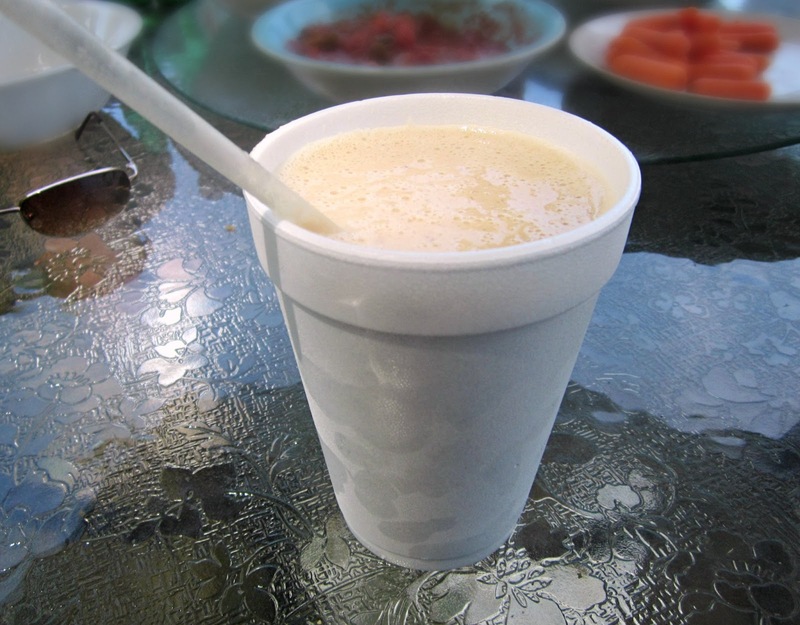 The frosty drink went perfectly with grilled steaks. Brian's brother, Scott, brought over some prime bone-in rib eyes. Decadent and ridiculously tender. 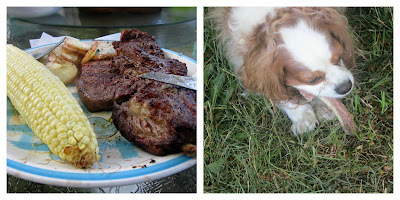 And, the beef bones made for an extra special treat for Hadley. So, despite some scorching weather, we had a great long weekend with good food, drinks, company, road trips and fun. Just exactly our kind of summer. So long till next time! Sounds like a fun weekend to me! 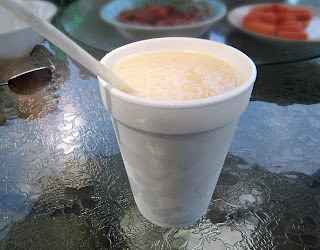 I first tried a BBC in St. Lucia and was hooked. They were deliciously creamy and refreshing and ill have to try this recipe at home. What a great trip! I love the farmer's market in your area also has food, and a place to eat it. That drink is now on our list because MPE loves banana and rum so this is a "must make" for us now! I am definitely drooling over this! What a wonderful weekend!! Looks like you had amazing weather! My kind of weekend, sounds great!